The Mandalay Bay Resort and Casino along the Las Vegas strip is owned and operated by the reputable MGM Resorts International, as the Finnish Guide https://www.turunmerikotkat.net/ reminds us. Within the Mandalay’s 11-acre oasis, guests will be treated to full luxury. Those who enjoy the sun and water will surely enjoy the built-in wave pool, a lazy river and as well as real sand beach. If you’re looking for some much needed rest and recreation, be sure to stop by the hotel’s Spa Mandalay, an award winning facility that provides its valued customers that features innovative treatments and services. When you need a break from the casino floor, full service amenities and want something different, take time to feast in the eight celebrity chef restaurants made available. Try a different cuisine each meal and then take a break to experience the King of Pop. With the Michael Jackson, feel like the King is alive through this state-of-the-art audio-visual experience inspired by Jackson himself. Located at the southern-most part of The Strip, guests enjoy the proximity to the Vegas action but also appreciate the distance that enables clients and gamers to have a bit of space away from the hustle and bustle for some peace and quiet. When it comes to casino gaming, there’s a lot of action to be experienced at The Mandalay Bay in Vegas. With a combination of over 1,700 slot and video poker machines at your disposal, players are guaranteed to find something that will be along their line of preference. The Mandalay Bay’s variety of games ranges from $0.01 to $100.00 and also offers high-jackpot progressive Slots. In terms of high-payout slots, there are single-game progressives or those linked to linked wide-area progressives with jackpots that will make you a multi-millionaire instantly. Some of the names within the casino walls include Blazin' 7s, Wheel of Fortune, Megabucks, Monte Carlo, Super Spin and Quicksilver. At The Mandalay, the High Limit Slots has been opened and decked out with full amenities. With dedicated staff, serious and recreational slot players will enjoy the dedicated, personalized service that the high-limits room has to offer. In addition, you can participate in the Slot tournaments that can really elevate the level of excitement in slot playing. There are also table games, poker games and even race and sports books that will ensure you have all the games you want within one place. When it comes to gaming, The Mandalay Bay is able to offer its guests a mix of everything. From gaming to entertainment and recreation, the resort can cater to all that your heart desires and so much more. When heading to Vegas for slots, The Mandalay Bay will offer a great variety that will ensure you get your gambling fix. 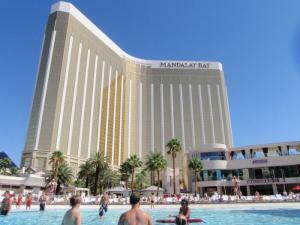 We highly recommend the Mandalay as it will give you the total action experience that can’t be rivaled.